This How-To will walk you through Configuring Windows Server 2012 R2 NIC Teaming to a Hyper-V Virtual Machine. 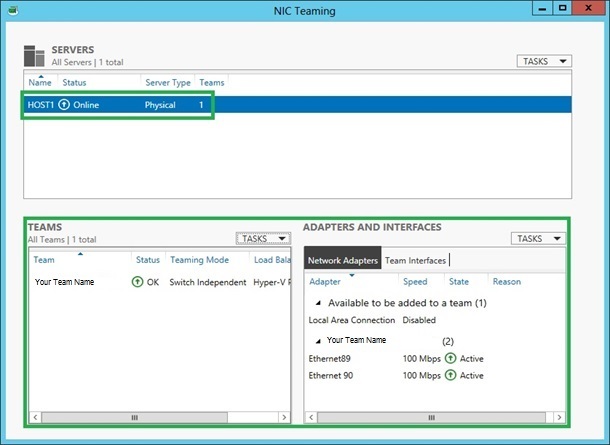 NIC Teaming is the name Microsoft gives for the process of combining multiple network interface controllers (NICs) together for speed, redundancy or both. – A Windows Server 2012 R2 server with the Hyper-V role installed. – Minimum 2 NIC cards installed on your server. Open the Server Manager. Right click on Hyper-V and select Configure NIC Teaming. Locate the Task drop-down and select New Team. 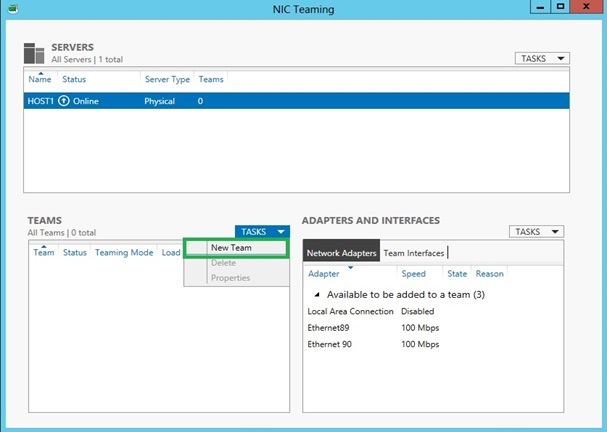 (Note: You will see the available NIC’s in the Adapters and Interfaces section). You will get a red Fault alert on the status. Don’t worry it will come right up shortly and change to a green OK status. Click on the Team Interface tab. Right-Click on your Team Name and select Properties. 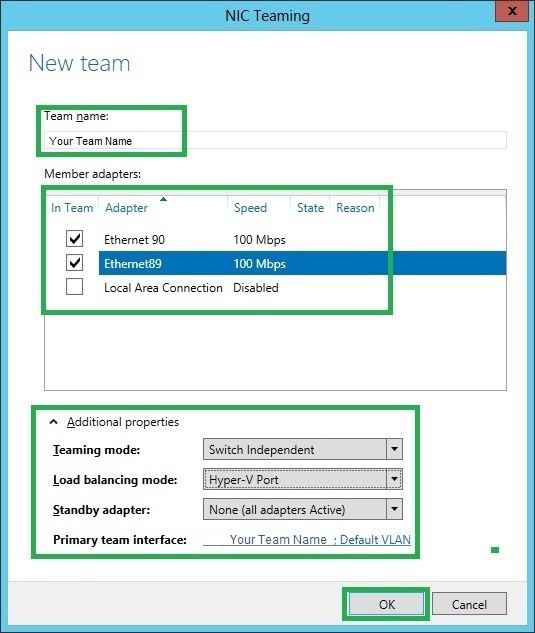 In the Properties, you should see the Description set to “Microsoft Network Adapter Multiplexor Driver”. In the VLAN membership, verify that the Default option is selected and click OK.
Go to Control Panel. Click Network and Internet. 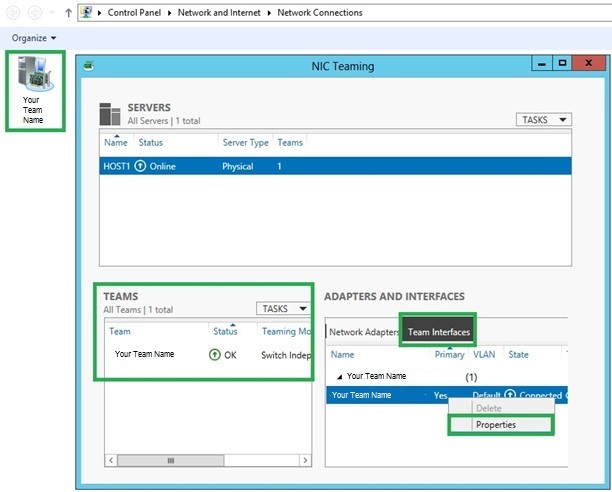 Click Network Connections and Right-Click on Your Team Name. 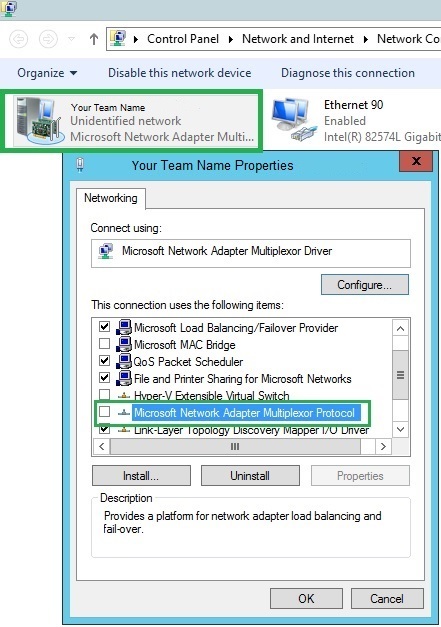 Activate the “Microsoft Network Adapter Multiplexor Protocol (If it is not already checked). Go back to the Server Manager. 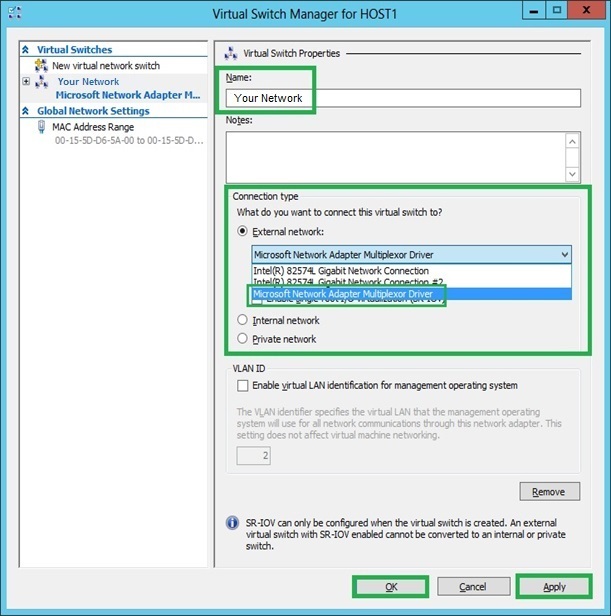 Right click on your server and select Hyper-V Manager. Select the Virtual Switch Manager. Click Create Virtual Switch. Create a Name for the Virtual Switch. Select External Network. 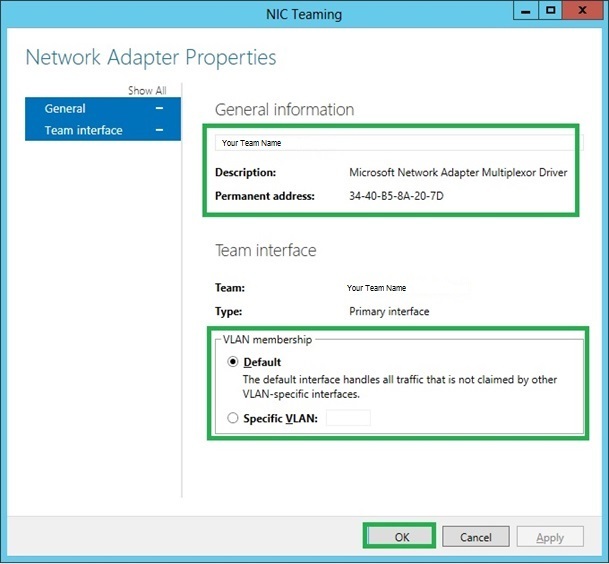 Click on the Microsoft Network Adapter Multiplexor Driver. Verify that the “Enable virtual LAN identification for management operating system” is checked. Then Click Apply and OK.
Verify that NIC Teaming is working properly. Unplug one of the Network Cables on the NIC and notice that the server will remain with the network connection. Plug the Network Cable back and try it with the other Network Cable. (Note: You can also open up the command prompt while having one of the Network Cables disconnected and PING the Server. You will get a Reply from the Server with no problem). Congratulations! 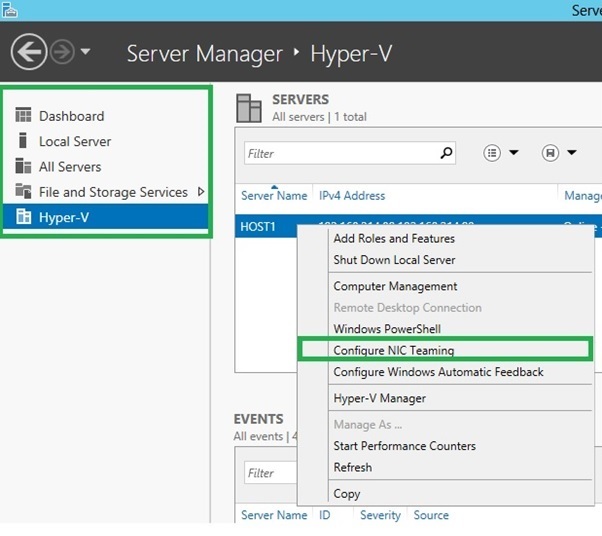 You have just Configured Windows Server 2012 R2 NIC Teaming to a Hyper-V Virtual Machine. Thank you for following along in this How-To and check back with us for any new updates. If you’re interested in testing this tutorial in a HIPAA-compliant environment, consider HIPAA Cloud Storage Hosting from Atlantic.Net.